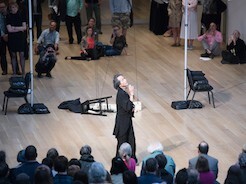 Eiko and Koma for the first time performed their solos back to back on April 20, 2017 in the entrance lobby of the Modern wing of Art Institute Chicago. Their performance was presented as a response to the photo exhibition, PROVOKE: Photography in Japan between Protest and Performance, 1960-1975. The exhibition presents the works not only of the photographers who created the short-lived widely influential photo magazine Provoke, but also of the preceding and younger generations of the radical photographers. Eiko and Koma truly appreciated this occasion to experience the rigorously curated exhibition by Diane Dufour, Duncan Forbes, Walter Moser, and Matthew S. Witkovsky, and the vivid memories and reflections that were again “provoked” by the photos and talks in the gallery.